How many user types in SAP? What are the functionality of Dialog users? What are the difference between Dialog and Service users? What are the difference between System and Communication users? What are the functionality of reference users in SAP? How to create users in SAP? Logon with SAP GUI is possible. Therefore the user is interaction-capable with GUI. Expired or initial passwords are checked. Multiple logon is possible but we can restrict by parameters. Ex- End Users, Supports User etc. Logon with SAP GUI is possible. Only user Administrator can change the password. The password cannot be initial or expired. Logon with SAP GUI is not possible. Only Administrator can change their passwords. It is used to communicate within SAP System. It is also one type of Background user and communicates between Systems. No dialog logon is possible. It is used to providing extra privilege / additional authorization of a user who is going on vacation or leave to existing users. Ex- Internet User with identical Authorizations. How to apply Trace in SAP HANA Trace files are used to troubleshoot problems in the SAP HANA Systems. Trace files containing useful information for error analysis. Reason: When query a view or performing data preview you receive error. To find the particular missing authorization. For performing Trace activity. You should have TRACE ADMIN System privileges. How to use Authorization trace: 1- Activate the trace for a specific user. Activate authorization trace for specific user: Connect to System via HANA studio. Click on User Specific trace. Trace has been activated for user successfully. Now reproduce the error with affected user. System Privileges are used for Administrative Tasks. This can be assigned to users directly and via roles also. This can also be assigned to roles. Reason: find out how many users have DATA ADMIN system privileges or remove CATALOG READ from all the users. A database user should have CATALOG READ System Privileges to run the query about other users. It is mandatory to specify Privilege name in where clause of above query. The below query will show the users who have DATA ADMIN Privileges. SSL certificate should be exported from the SAP NetWeaver Administrator and imported to the keystore used by the client Identity Management Developer Studio. This is required for communicating securely with the server. 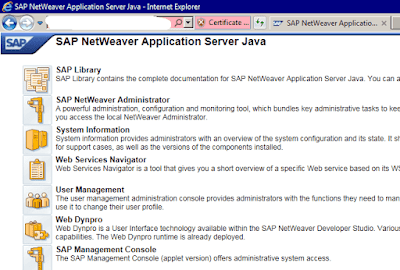 Click on SAP NetWeaver Administrator. Now you will login to SAP NWA with credentials. Choose configuration tab and open SSL. Select the added SSL access point (port) in the SSL Access Points section. The details of the selected port will be displayed. From the Server Identity tab for the SSL port, select the private key entry and choose Export Entry to export the server's certificate directly from its private key entry. In the Export Entry to File dialog box, select export format PKCS#8 Key Pair.